Delaware Arts Info: The DSO is back…and kicking! The DSO is back…and kicking! 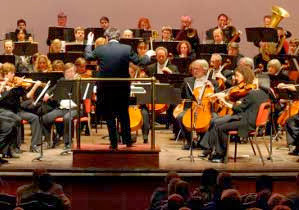 The Delaware Symphony Orchestra boldly began their new 2013-2014 season with a new piece and three exciting works from the standard orchestral repertoire. But nothing is standard about the analysis and pre-concert lectures by Maestro David Amado. His wit, vocabulary and inquisitive mind make his talks on music well worth a hurried supper. He did not disappoint with his thesis that Igor Stravinsky took the theme from Debussy’s Prelude to the afternoon of a faun for his Firebird Suite. The audience and I were perplexed by this comparison of a raucous ritualistic dance being the same as an impressionistic daydream, but on closer examination one can see it. Would that the Maestro had once again let the orchestra open their season with the version of the Star Spangled Banner for which the composer was arrested, but the audience happily sang along for the standard version from the Arthur Luck collection. The DSO’s Music Committee was courageous in choosing a new piece to begin the concert and they made a safe choice: Robert Ward’s Festive Ode is a marvelous mix of extremely well-orchestrated American music which allowed each section of the orchestra to be highlighted and it was a fun homecoming experience. Misha Dichter took command of a beautiful Steinway grand which had so much horsepower that he managed to overshadow the orchestra for a while, but pulled back with his sensitive yet untrammeled version of the famous Variation 18. The percussion section was magically energetic with the dies irae theme, hats off to the glockenspiel! Mr. Amado had the orchestra illustrate the themes of the Prelude to the afternoon of a faun by Claude Debussy. The soft colors of the orchestra told us that none of the players had lost any luster in the rough and uncertain past year. The dynamics were so soft, especially with Katy Ambrose’s delicate horn entrance on a whisper. What a woodwind section the DSO has as well! After the impressionistic pastels came the thunderous Firebird Suite. The strings outdid themselves with a super soft beginning and eerie harmonics. The clarinets took the magic jazzy, klezmer lines and played them as if they were easy as pie. The Infernal dance had that unleashed wildness led by Donna Battista on piano and some great percussion on xylophone. Jon Gaarder played a smooth and controlled lullaby solo before the thunderous finale. Welcome back to the Grand, Delaware Symphony Orchestra!